With these opening lines, Rusty Barnes begins to take you on a trip into a noir landscape like few you have recently seen. Be sure to buckle up because he is going to have you white-knuckled as you race through this beautifully written and fast paced book. 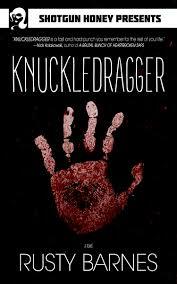 What comes to mind when you hear someone being described as a Knuckledragger? Do you think of a big lumbering, oafish man who is perhaps a bully who uses his mass more than his brain to get what he wants? Well the mental image this word conjures might not change too much after reading Rusty Barnes’ latest page-turner Knuckledragger. In this blazing hot read, John “Candy” Stahl works as a low-level bone breaker for local crime boss Otis. Candy asks few questions concerning the jobs he is tasked in doing; whether actually breaking bones or just smashing up a local business to collect on an outstanding gambling threat. Content to follow orders, Candy finds himself drifting though days with his sometime sweetheart, Rosario helping to keep his nights full. But when Candy interacts with Otis’ girlfriend Nina and her son Miguel, he soon finds himself on the wrong end of a brutal beating ordered by Otis. After healing his wounds a bit, Candy finds himself placed in an assignment which forces him to interact more personally with Nina and her son. Despite his intentions of keeping everything out in the open, he finds himself drawn into an affair with Nina and incurring Otis’ wrath once again. With his libido leading the way, Candy is destined to put everything on the line in an unavoidable showdown with Otis and either come out with everything he wants or not come out at all. Barnes has a great feel for grit; the characters are gritty and sleazy, the setting is gritty and bleak, and the dialogue to true to form. The paintbrush Barnes uses leaves no color and only streaks of depressing grey. This book is noir at its best. Candy starts out as nothing but hired muscle and he is fighting for a slice of what he thinks will lead to happiness, but in actuality he is only fighting for more heartache. Like all great noir, there are no heroes and no winners in this one.